Not to be confused with Blocking (American football). 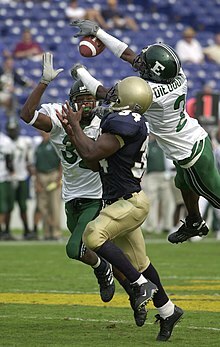 In American football, a pass deflected, also known as a pass deflection, a pass defended, a pass defensed, a pass knockdown, or a pass breakup, is an incomplete pass that is caused by a defensive player. This is done by slapping or blocking the ball with a hand or part of the arm, knocking the ball to the ground. It can also be done by aggressively hitting the receiver at the exact moment he first makes contact with the ball, or shortly thereafter, jarring the ball loose. If the defender hits the receiver before the latter first makes contact with the ball, it is pass interference. ^ "Pass Deflection (football statistics)". Acronym Finder. Retrieved 2012-01-04. This page was last edited on 7 February 2019, at 11:24 (UTC).